Fox in a Box - Chicago is located in the basement of Dearborn Galleria. Look for the Byline Bank sign in front of Dearborn Station. Enter in the doors near the sign, and look for the stairs with the sign above it. Go down the stairs, turn left and go down the long hallway. 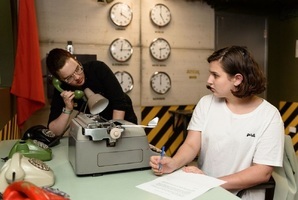 Reviews of escape game "Zodiac"
My group had completed all of the rooms at Fox in a Box and were so excited to hear they were opening a new room this year - Zodiac. We came as soon as we were able to find a date, and it did not disappoint. Because it’s so new, there are still a few small technical difficulties being worked out, but it didn’t take away from the experience at all. Libby quickly came over the intercom to apologize when something didn’t work right and helped get things quickly back on track. She was a spirited, fun game master. This was the most advanced room they have in terms of design - most of the others are all lock-based puzzles whereas zodiac has some newer technology. As with all their rooms, the set design is great, and this one was appropriately creepy without being actually scary. I hope they will continue to change out their rooms so we can come back some day! We went for my friend's birthday. We did the Zodiac room and it was a lot of fun with twists and surprises that I didn't expect. I've done Escape Rooms before but this one was pretty unique.